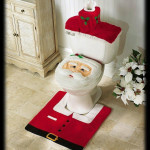 Dear Santa Letter Week is the second week of November. 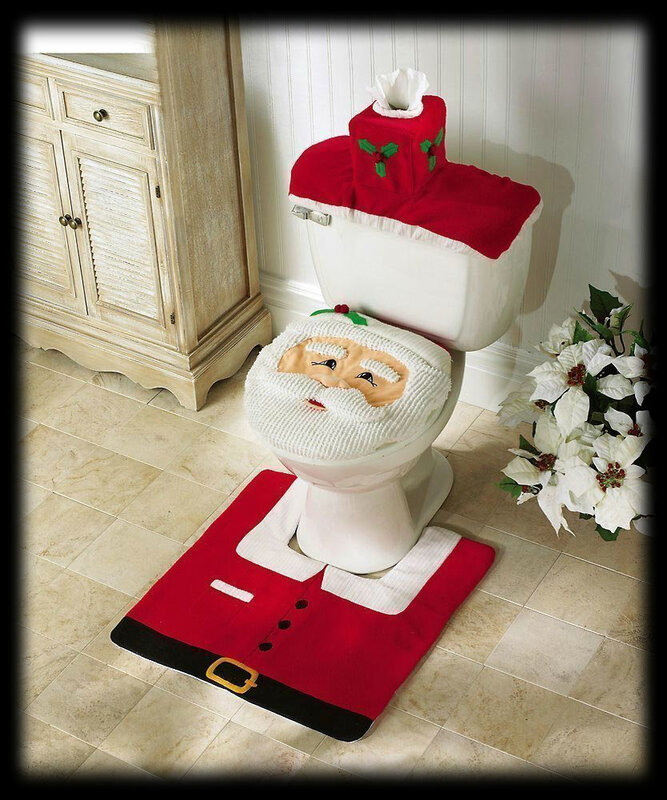 With the cooler weather here and the opportunity to spend more quality time its a great time to get together and have the whole family write letters to Santa. It is not only a great family time event but an opportunity to help our little ones practice their writing skills as well. Building imagination, creating memories and traditions are all things that could happen simply by writing Santa a letter. 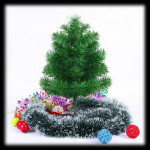 The best part is that you may get a good idea early enough to be able to get your child what they want for Christmas. 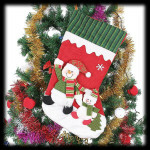 Take a bit of time and take your child to the post office have them mail the letter their self. It may even be possible to talk to the post master and have them explain to your child what happens to the letter after it is put in the mail slot. Make almond-steeped milk: Combine whle milk and chopped almonds in a medium-sized heavy saucepan. Heat to boiling over medium heat. Cool to room temperature; pour into a container and cover. Chill in the refrigerator overnight. Make almond-steeped cream: Combine heave cream and almonds in small, heavy saucepan. Heat to boiling over medium heat. Cool to room temperature; pour into a container and cover. Chill in the refrigerator overnight. Make crust: In a medium-sized bowl, combine dry crust ingredients. Pour in melted butter. Rub the butter into the crumbs with your fingers until the mixture holds together when squeezed in the palm of your hand. Lightly brush a 9-inch pie tin with melted butter. Place crumb mixture in the tin and press firmly into an even layer across the bottom and up the sides of the pie tin. Place a second, 9-inch disposable pie tin on top of the crumb mixture and press down firmly, working your way out frm the center to smooth the crumbs from the center of the pie tin toward the edges.Remove the top pie tin; fill in any bare or thin spots. Place the finished shell on a baking sheet and bake at 350 for six minutes. Cool. Drizzle shell with a light coating of melted bittersweet chocolate. (NOTE: thick is not better as you will never be able to slice through the pie!) Chill in the refrigerator until chocolate hardens. Make filling: Place leaf gelatin in small bowl of icewater. Set aside to bloom for 10 minutes. Strain the almond-steeped milk into a 1 quart measuring cup. You should have 3 cups of milk. If not, add fresh milk to make up the difference. Meanwhile, place the sugar and cornstarch in a bowl and whisk to combine. Place the egg yolks and egg into a medium, heatproof bowl. Whisk in the sugar and cornstarch. Gradually, in several additions, whisk in the hot milk mixture. Pour everything back into the saucepan and whisk constantly over medium heat until the pastry cream begins to thicken and starts to boil (about 1 1/2 to 2 minutes.) Whisk at a boil for 2 more minutes. Remove from the heat. Remove the leaf gelatin from the water. Wring out excess water; whisk gelatin into the pastry cream until it dissolves. Whisk in the butter, vanilla paste and 1/8 tsp salt. Pour pastry cream through fine-mess strainer into a heatproof bowl. Place a piece of plastic wrap directly on to the surface of the pastry cream and gently smooth with your fingers. This will prevent a skin from forming on the top of the pastry cream; chill pastry cream in the refrigerator until firm (about 3 hours) When pastry cream is firm, strain the almond-steeped cream into a liquid measuring cup. you should have 1 cup of almond-steepd cream; if not, add enough fresh heavy cream to make up the difference. Remove firm pastry cream from the refrigerator. Whisk pastry cream until smooth. Using an over/under motion with a spatula, gently fold in the whipped cream until no streaks of whipped cream remain. Cover with plastic wrap and chill 1 hour. In the bowl of a stand mixer fitted with the paddle attachment, mix coconut flakes, sweetened condensed milk and coconut milk until thoroughly combined. Pour condensed milk mixure into prepared pie shell and spread evenly. Top with 1/3 cup of almonds. Sprinkle with pinch of salt. Remove almond pastry cream from fridge and whisk until smooth and fluffy. Spoon on top of the pie. These book angels are adorable. They all look really great. can you see how pretty they are?? These adorable log snowmen were being created for the craft show by a good friend of mine. Adorable are they not. Do you enjoy going to craft fairs?? Do you sell your own?? 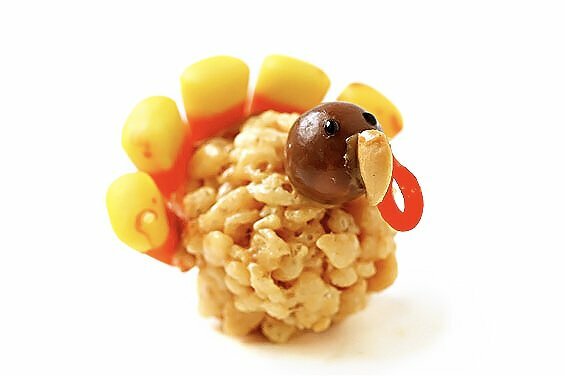 This fun Peanut Butter Rice Crispy Treats Recipe is both delicious and creative. You'll love it! more peanut butter for "glue"
*I recommend using regular peanut butter, not natural peanut butter, for maximum stickiness. Bend the pipe cleaners in half, so they make a loop on one end. 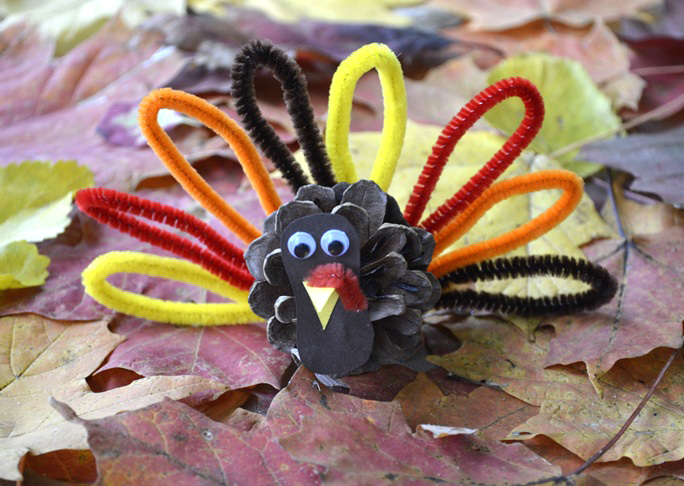 Lay the pipe cleaners out so they look like a fan, with the loop at the top of each one. Rotate the colors so you have one of each color, then repeat the same order a second time. 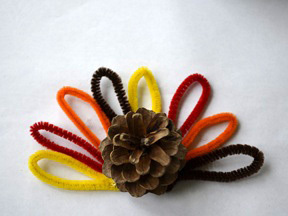 Glue all of the pipe cleaners together where they join at the base, then glue them to the wide end of a pine cone. Set this aside to dry. 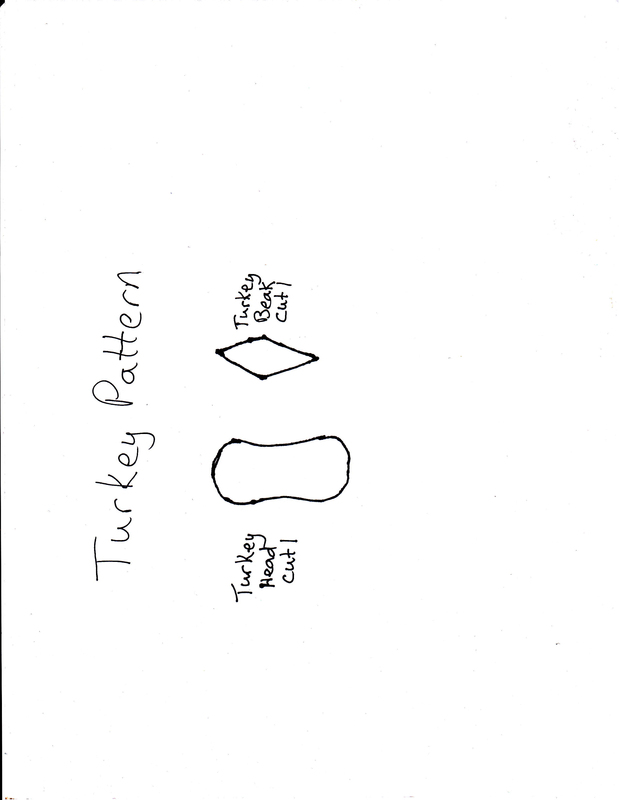 While the tail is drying, print out the Pinecone Turkey Pattern and cut it out. 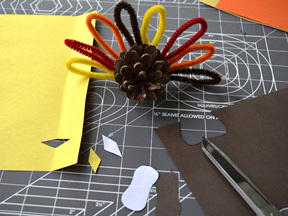 Use the pattern to cut out one turkey head from brown construction paper, and one turkey beak from yellow construction paper. 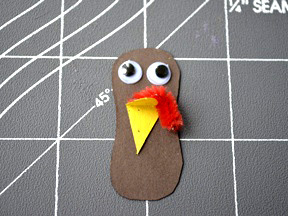 Stick the wiggly eyes to the turkey’s head. Most wiggly-eyes comes with a sticky adhesive backing, but if your don't simply add a little dot of glue to the back of each eye. Fold the beak in half, and glue it on the fold below the eyes. 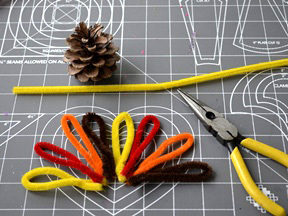 Bend the small piece of red pipe cleaner, then glue it in place above and down the side of the beak. Glue the head to the narrower end of the pine cone. 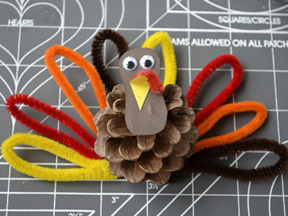 Display your Pine Cone Turkey on your Thanksgiving table. Add a name card and use it as a place holder. I found this on a facebook group Recipes of Days gone by. It is a great group since I love vintage recipes both to cook and eat. I grew up in an era that many would consider a vintage era. LOL. This is a recipe that I had personally never made or ate before but it is definitely on the list to make and try now. Hope you enjoy. Preheat oven to 300 degrees and grease a sheet pan. Trim crust off and cut bread into 1-inch strips. Pour milk into a shallow pan; empty coconut onto a plate or on top of a sheet of waxed paper. Take strips of bread; roll in milk and then roll in coconut. Place coated strips on sheet pan. Bake in oven for about 15 minutes or until coconut begins to turn golden brown. Remove from oven and transfer macaroons with a spatula to waxed paper on plate or counter to allow it to cool. 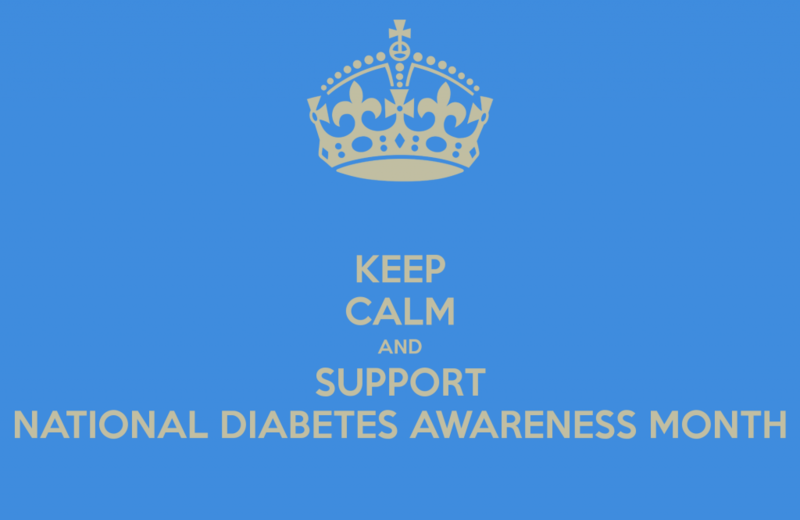 November is National diabetes awareness month. Diabetes is a fairly common but also death warranting disease. I myself live with diabetes and battle with it daily. While it affects masses of individuals it is one that can be controlled by living conditions, diet and exercise. The American Diabetic Foundation estimates that 30 million adults and children have been diagnosed with diabetes and even more have pre-diabetic symptoms for type two diabetes. Deliciously Savvy is Hosting a Giveaway for 1 Lucky Winner to Receive several Holiday Decor Items (listed below) from Ohuhu PLUS a 72 Pack of KCups from Workaholics Coffee / Two Rivers Coffee. Total Prize Package is worth $130! The Coffee is Perfect For Surviving The Holidays and The Decor is Simply Adorable! 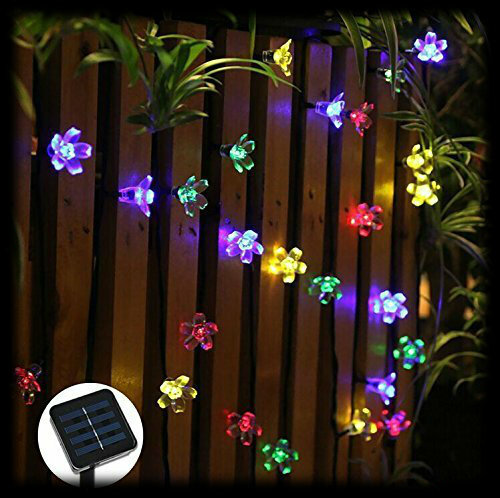 There are Free and Paid Options available and I Can Use Everyone's Help To Make It Huge! Thanks for all you do! That is 6 ~ 12 Count Boxes! Yumm!!! President Ronald Reagan designated November as National Alzheimer's Disease Awareness Month in 1983. At the time, fewer than 2 million Americans had Alzheimer's; today, the number of people with the disease has soared to nearly 5.4 million. I work daily with individuals who each and everyone of them played a role in some ones life. All to often the families struggle to deal with the new disease and step away. Please remember these individuals all still love you, they may not remember who you are but talk to them each of them can tell you stories of the past and some stories you may or may not know listen for a while. I have carried for a lady that can not remember 5 minutes of her present situation but talk to her about her husband , her grand-sons, her daughters, her church and she will tell you all that she remembers. They are still there just playing a different role. 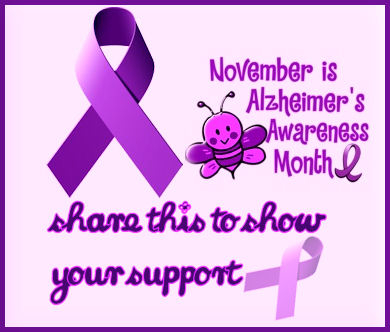 I support all those who are caregivers, suffers, families, and anyone who's life has been touched by Alzheimer's disease. The first week of November helps draw awareness to one of the many problems on the highway. The problem of drowsy driving affects every age group over the legal driving age. 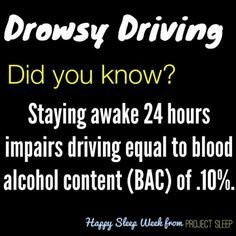 Whether its school, work, late nights or long drives the reason can be many the problem all the same driving while drowsy. We often lie to our selves and believe we can keep our mind alert even when we are tired and our brain and body is drained. Sleep is a powerful biological force that can overtake and trick even the most experienced driver. You may have thought to roll down the window and turn up the radio but when those tricks don't work its time to pull over for the safety of those in your vehicle as well as all on the road. The pre-drive nap: taking a short nap before a road trip can help make up for a short night's sleep. The mid-drive nap: if you find yourself drowsy while driving, pull over to take a short nap of 20 minutes. Make sure you are in a safe location and remember you'll be groggy for 15 minutes or so after waking up. The Buddy system: It's safest to drive with a partner on long trips. Pull over every two hours and switch drivers, while the other takes a nap if possible. Don't rush. Better to arrive at your destination safe than on time. Don't drive between midnight and 6 a.m. Because of your body's biological rhythm, this is a time when sleepiness is most intense. Drink caffeine: caffeine improves alertness, although be aware that the effects of caffeine will wear off after several hours. Did you know that November 4th is National Candy Day? Well, I know what you are thinking. Yes, I know as well as you do that we just got over the big candy day where we took our children to trick or trunks or if you were brave enough (and I must say that we were) you went the old fashioned route as well and went trick or treating door to door. Got lots of candy?? Then the stores that had the giant get rid of Halloween and move onto Christmas all ready sale where lots of candy was sold at discounted prices. So now you may find your self with lots of candy so why not make up some delicious brownies where you can throw in anything you want and all will be enjoyed and the more taste the better. Here is the perfect recipe for candy day as well as after Halloween or any holiday as far as that goes. Bake your favorite brownies; top immediately with chopped and mini candies. Add some pretzel pieces--you'll love the salty-sweet touch. Bake 5 more minutes or just until candy melts a bit. King Tut Day which is celebrated on the date that King Tutankhamen's Tomb was discovered happens on the 4th of November every year. 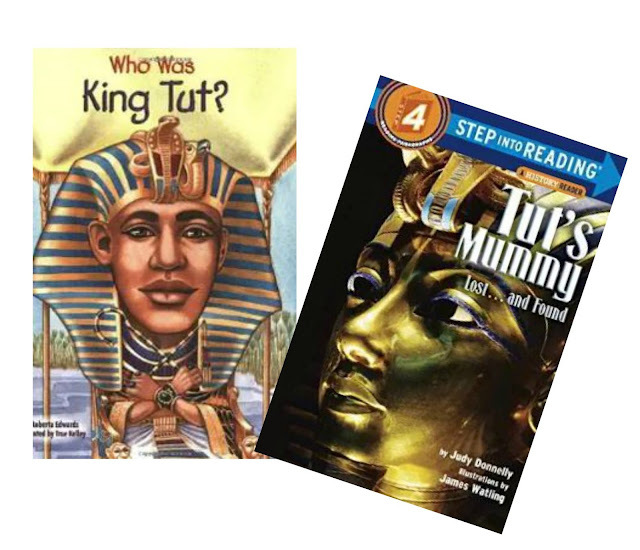 Over 3,000 years ago, King Tutankhamen became the King of Egypt, he was the mere age of 9. His life was short lived when he died at the young age of 19. 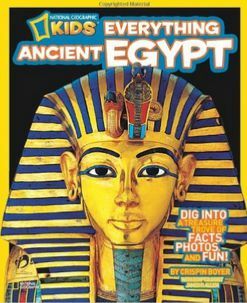 King Tut's tomb was discovered on November 4, 1922 in the Egypt's Valley of Kings. In a large heavy pan, cook the bacon, one or two stripes per person, turning frequently, until golden-brown and crispy. Drain on paper towels. Brush the bread slices on both sides with olive oil. 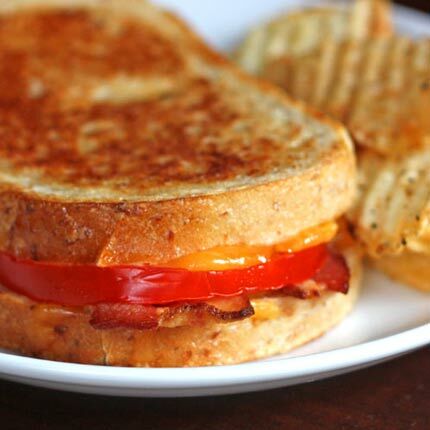 Slice the tomato into ¼ inch thick slices and place on ½ of the bread slices. Sprinkle a little bit of salt. Place all the bread slices (both those that bear tomatoes and those that don’t) on a cookie sheet and bake for about 10 minutes, until the bread is golden and the tomatoes heated through. Carefully remove the pan from the oven and place slices of cheese on the tomato-free slices of bread. Top the cheese with the cooked bacon. Return the bread to the oven and continue cooking until the cheese melts. Carefully, using clean kitchen towels or mittens to protect you hands, combine the tomato slices and cheeses slices into sandwiches. Press them together to create a grilled-cheese effect and serve immediately. Today, November 2nd is National Deviled Egg day. I for one love deviled eggs. I chose this recipe to share in honor of all the football playoffs. The hopes and dreams of our local football teams was dashed when they fell to other high school football teams. There are a few other towns not so far away that will be doing battle this coming weekend. Maybe there will be some tables set that will share these delicious football shaped deviled eggs. Today was a hard day for my son and his girlfriend. Sending their young son to school was hard to let go. Just a few hours a day is all it is and yet the separation anxiety was worst on the parents than with my grandson. Do you remember sending your child to school for the first time? Line baking sheet with foil. Stir chocolate chips in heavy medium saucepan over low heat until melted and warm (not hot) to touch. Pour chocolate onto foil; spread to ¼-inch thickness (about 12x10-inch rectangle). 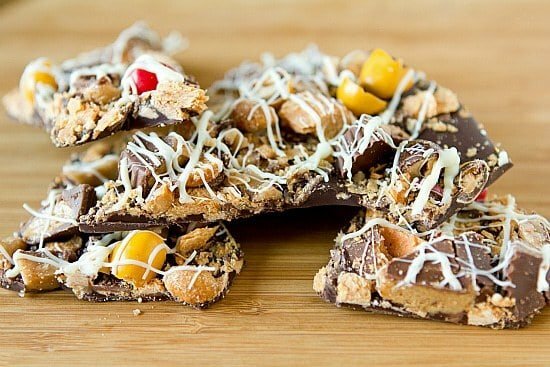 Sprinkle with Butterfinger candy, toffee, peanut butter cups, and nuts, making sure all pieces touch melted chocolate to adhere. Put white chocolate in heavy small saucepan. Stir constantly over very low heat until chocolate is melted and warm (not hot) to touch. Remove from heat. Dip spoon into chocolate; wave from side to side over bark, creating zigzag lines. Scatter Reese's Pieces/M&M's over, making sure candy touches melted chocolate.